If you are wondering how to file for divorce in Pennsylvania, the procedure you follow depends on whether you and your spouse agree to the divorce and division of marital property. The state's divorce procedures are somewhat simple, but its laws contain nuances that may make some divorces more complicated. Keep in mind that to file for divorce in Pennsylvania, at least one spouse must be a resident of state for a minimum of six months. How Can I Get a Divorce Without an Attorney? The spouse claiming one or more of these grounds must prove the grounds. Failure to prove grounds does not result in dismissal of the complaint, but will require the court to treat the petition for divorce as a no-fault one. The mutual consent of both parties; 90 days must have elapsed from the date that the claim was filed. Both spouses agreeing that the marriage is irretrievably broken as evidenced by both spouses living apart for at least two years. If the complaint names either 'mutual consent' or that the marriage is 'irretrievably broken' as the grounds, the court may grant the divorce without a final hearing. The first step in the divorce process is to file a complaint for divorce in the court of common pleas in the county in which you or your spouse lives. The complaint should contain your and your spouse's full names and addresses, a statement that you have lived in the state for the previous six months, the date and place of the marriage and, in the case of a fault divorce, the grounds for a divorce. In no-fault divorces, you and your spouse typically divide your property and submit your property-division agreement to the court along with, or anytime after, filing the complaint. Ninety days later you and your spouse must file an Affidavit of Consent to the Divorce and a Waiver of Service for all further filings. Once the court receives these documents, it will enter the final decree of divorce. 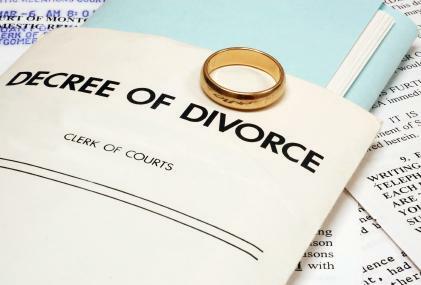 A no-fault divorce can take as few as 90 days to obtain. Many counties, including Lehigh County, provide access to free self-help divorce forms on their websites. In a fault-based divorce, your spouse must file an answer to your allegations with the court within 30 days of receiving your complaint. You are allowed 20 days after receipt of the Answer to file a Response refuting its statements. Ninety days after filing for divorce, you and your spouse must provide the court with an inventory of marital and non-marital assets owned at the time you filed the Complaint. At the end of the hearing the court issues a final order of divorce that addresses the division of property, establishes child custody, and any alimony payments. The length of time required to obtain a final decree of divorce in these types of divorces varies depending on the issues in dispute. If you have minor children, child custody and support will be important issues in your divorce case. Courts in Pennsylvania award custody based on the best interest of the kids. Under Pennsylvania law, courts consider the following factors when deciding how to award custody. Courts in Pennsylvania award child support based on state guidelines. Child support calculators factor in each parent's income, the number of children, child care costs, alimony payments, and the cost of health insurance for the child. The procedure for filing for divorce in Pennsylvania differs depending on the relationship of the parties. The state's divorce laws are relatively straightforward and do not require spouses to have legal representation. Additionally, most of the courts, such as the First Judicial District, provide self-help resources to individuals not represented by an attorney.